Home / Blog / Which Bath Lift Is Right For Me? Which Bath Lift Is Right For Me? All types of bath lift provide assistance getting up and down in the bath and can be easily fitted to an existing bath tub without any major bathroom changes. A simple bath lift can be lifted into the bath tub and secured with suction cups to the bottom of the bath, allowing it to be removed when not required. Other types must be fitted to the wall and have a belt that stretches over the top of the bath, down the side and secured to a bracket at floor level. One of the disadvantages of bath-lifts is that they do not help getting over the wall of the bath. The bather will either have to step into the bath or perch on the edge of the bath, swing their legs over and into the bath tub and then shuffle their bottom onto the bath lift seat. The manoeuvring required may mean some bathers find a bath lift is awkward to use, despite the initial promise the product suggests. Which is why, where people experience difficulty with getting into the bath in the first place, as well as getting up and down, the bath lift may not be a suitable solution. 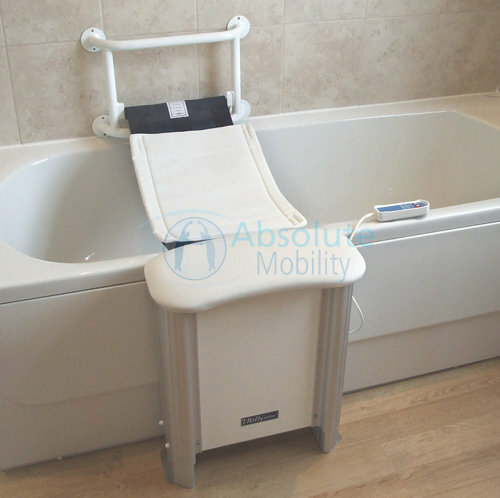 Having said that, a bath lift can be suitable for people who can manage the bath threshold, are still fairly ambulant and whose strength will aid them when they get on and off the belt or seat. However, a belt type bath lift may “pinch” people who have had a hip operation as the belt functions like a sling, so think carefully if this applies to you. What are the alternatives to bath-lifts? As you can see, whilst bath-lifts might be right for some, they may not be suitable for others. This can often lead to the question “what do I do if a bath lift is not right for me?”. The answer is that the bathroom will have to be changed. The biggest hurdle many people face is the threshold of the bath, which inevitably is a trip hazard and can lead to falls and injuries, just as much as struggling to get up and down once in the bath. People who find themselves in this situation, need to accept the time is right to change the bathroom and make it more accessible. A popular alternative to a bath-lift is a walk-in bath, provided the bather can manage a step height of around 8 or 9 inches (200 – 230mm). This is roughly the same as the step on a flight of stairs. A walk-in bath will be easier to step into and is available as a full length bath, just like the standard bath tub we all know, with the addition of an opening door that provides access into and out of the bath. Some full length walk-in baths have a power lift seat option available that provides assistance getting up and down in the bath. It is a more robust solution than the bath lifts mentioned above as it is built into the bath which permits a more stable and comfortable lifting and lowering experience. Another alternative is the sit in tub style walk-in bath, which has a moulded seat in place. These types of walk-in bath are easy to use as you just have to be able to get up and down from a seated position and the taps and plug chains are in easy reach of the bather. Should you prefer to talk with a specialist bathroom fitting firm about changing your bathroom, please call Absolute Mobility on 01491 411 041.